There are different types of longboards in the market. However, if the importance of using the best longboard surfboard is important to you, we would advise you to go for the Gold Coast Heritage Surfboard. For those of you who wants to know what a longboard is, it is basically a long and narrow shaped surfboard that is used as a platform for surfing. They are light but solid and thick enough to support individuals who use them to ride an ocean surface. The Gold Coast Heritage Surfboard is a high-performance longboard that has improved and unique features which makes it distinct. These unique features include PVC Lined Fin Holes, full-Length Double Concave on Bottom Deck and others. Read on to find out why this product is highly rated and recommended. What Is a Surfboard with a Soft Top Design? 1.Does this surfboard come with any form of warranty? 2.How is this product shipped? 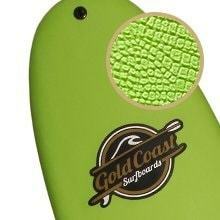 3.Which countries is Gold Coast Heritage Surfboard shipped to? This surfboard was designed by a Southern California based company in the center of the Manhattan Beach. As a result, it can be used in oceans, lakes, rivers, and canals as it has been tested in the waters of the Pacific coast. It was sensationally designed, and it offers a high level of durability and versatility. It gives its riders the comfortable feeling of classic longboard surfing with its sleekness. For beginners, it is superb and perfect, but it is also an excellent option for those with intermediate and expert skill levels. This surfboard is quite fast, highly maneuverable as it can handle several varieties of water conditions and also, it has a soft top design. From its name, you can deduce that it is a surfboard with a soft deck. Compared to the traditional fiberglass surfboards, it is a new technology that weighs less, floats better and doesn't get waterlogged. They are suitable and fun for surfers of all ages and abilities, from an inexperienced learner to a seasoned pro. It enables comfortable paddling and is also useful for learners as it is not prone to dings, cracks, and erosion, like a traditional fiberglass surfboard. Even, it can survive airports to travel. It offers a safer surfing experience for the rider as it softens blows to the head and prevents damage. Surfboards with a soft top design are also relatively cheap. 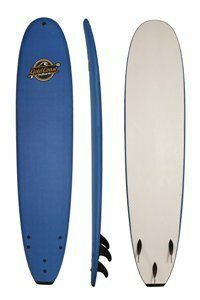 Durability: Designed with a Mold and Vacuum Sealed Strengthening process not cheap heat laminated, dual 6oz complete coverage layers of Resin from Top-to-Bottom to ensure more rigid and long-lasting surfboards. Surfboard Fins: FCSII Tri-Fin thruster system, fiberglass PVC fin holes, 3 Gold Coast thruster screw in fins and five fin screws. With the aid of a slight tail rocker, a surfer can handle sharper turns easily. Also, the nose rocker helps in preventing nose diving. These rockers also aid beginners in learning how to surf and cruise waves. This surfboard was designed with mold and vacuum sealed production process. This was done with the aim of increasing the board's overall durability. This method of construction has proved to be more active regarding strength than other methods used by competing producers/manufacturers. For you to be able to choose among the best longboard surfboard brands, you need to check what system is fitted into the surfboard and how well it's done. This surfboard has an FCSII Tri-Fin thruster system and Gold Coast screw in fins that enhance extra stability, ease of pivot and durability. It also has the unique feature of PVC Lined Fin Holes that serve to prevent water entry. 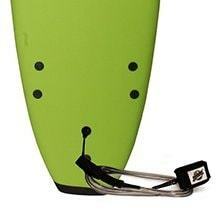 For extra speed and better Fin Performance, this board was designed with full length double concave on the bottom deck. It has Top-to-Bottom layers of Resin for extra rigidity and durability. It was designed with the most durable resin Epoxy which is also expensive. Just like every other product or surfboard that you see available in the market, this product you are considering has its merits and demerits. However, unlike so many other products available in the market, the pros of this surfboard product far outweigh its cons. There is no board wax required. It has rails that are hand tapered. Surfers with beginners, intermediate and expert skill levels can use it. The product offers excellent delivery and customer service. It is responsive, fun to use and able to turn and cruise waves easily. It is very durable and light enough to allow for carriage to and fro the beach. It is also relatively inexpensive. It can be quite thick for some to adjust to. If it is significantly damaged, it might prove to be more difficult for you to repair. Generally, any board that has a length of 8 to 9 feet is considered a longboard. As a longboard brand, it has substantial and significant buoyancy and a planning surface which makes it more suitable to ride waves that are considered too small to thrust or propel a shortboard. With a longboard's size, ability to quickly catch waves and forgiving nature, it is quite suitable for beginners as it is easier to learn on. Check out our article on the best body boards if you are looking for one too. Also, there is more space to perform noserides and cross-steps. This surfboard would enable you to learn all the longboard surfing techniques. With an 8'8 length, the surfboard can pivot and rail turn easily. This is an essential question that concerns you. Yes, the company offers a one-year warranty in the case of defects in workmanship and material. Also, there is a fifteen-day money back guarantee. It is shipped down to you with no extra payment for shipping. It will be shipped in a custom printed box either through FedEx Ground, FedEx Freight or USPS and the usual handling time is 1-2 days. Currently, Gold Coast surfboards are only shipped to the United States and Canada. 4. Can I get a discount for multiple purchases? YES, for a minimum quantity of five surfboard, you can get a discount. ​5. Can I pay for a surfboard on a Payment Plan? Unfortunately NO, this is not allowed. But you still can pay for your purchase with a credit card. 6. 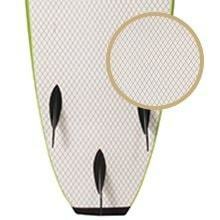 Are fins and leash included in each purchased surfboard? YES, the leash and fins for the Gold Coast Heritage surfboards are included in your purchase. 7. Does my ordered surfboard come with a bag? NO, unless a Beginners' Package is purchased, a day bag would have to be ordered separately. 8. How can I maintain my board? Except in use, your surfboard should remain in its bag. The bag safeguards your surfboard against everything once it's out of the water. Always rinse off salt from your board with fresh water as salt is very corrosive and does severe damage to it over time. Endeavor to stand it upright, horizontally with its fins facing up. Always transport it safely, do not leave it hanging over the sides of your vehicle as another driver can quickly swipe it. Dings are liable to occur. Try to fix your dings as soon as they occur so as not to weaken the integrity of your surfboard. 9. How can my board be repaired? This can be done with the aid of wax, standard hot glue guns, and duct tape. In the case of gashes or cuts, you can spray water rejecting material on the foam of your board to avoid water entry. You can also send pictures of the damage to Gold Coast to solicit further assistance. For the best surfing experience, it is essential that you go for the best surfboard. However, given the many options available to you, trying to pick the best may prove to be a daunting and uphill task. We understand this, and that's why we answer questions you might have in the review of best longboard surfboard. In this review, we believe we have done an excellent job of informing you of the attributes of the gold coast heritage surfboard. All these attributes constitute the reason that we rate this outstanding surfboard 4.8 stars rating out of the possible 5.